In the many considerations that arise during end-of-life care, swallowing problems are common and may have a disproportionately large impact on the patient and family. Inability to eat safely or tolerate diet results in nutritional challenges, difficulty maintaining physiological reserve and resilience, and isolation from social activities. The latter may in fact be the most troubling aspect for those wishing to optimize remaining precious time, given that most social interactions are based on meals and deglutition. A clinician providing care and support in a palliative care setting must recognize the risk of swallowing impairment and should actively query the presence and degree of problems encountered. Many interventions and strategies are available to mitigate swallowing difficulties and are best managed in a team setting with input and feedback from all team members in conjunction with the patient. 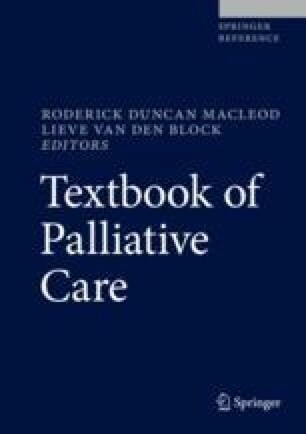 This chapter will cover key aspects of deglutition, how it may be altered in unwell patients, and available interventions that may be appropriate for those receiving palliative care.